did you forget it in your back pocket?? my phone always falls off my bum and clatters into the street when i try that!! A little into my ride I realized I hadn’t packed my phone, but was too lazy to go back. That’s the best feeling. That, “you know what? It doesn’t matter” moment. The poptarts at work are not labeled. Most of the time, it’s smores since people don’t like it as much. Having seen a strawberry poptarts box earlier this week, I grabbed one then et voila, t’was the strawberry I sought! I noticed that I could feel the sprinkles through the bag, so I thought I had a trick. I went back to grab another one that felt less bumpy… And it was brown sugar cinnamon?! Usually my favorite but I was craving . Oh well. Wait, @annietuna you’re a pop-tart fan too?? is one of my faves (assuming we’re talking frosted) but without a doubt frosted is my absolute favorite. 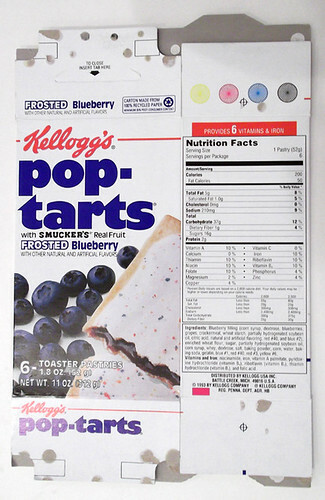 And to show my age, I used to love blueberry frosted until ~1989 when they changed the recipe. It was a dark day. I need to research this. YES SUCH A FAN. In my world there is only frosted. I grab cherry when it’s available – it is the best! Cherry in anything except for medicine is usually good. I’ve been drinking a sour cherry juice that Greek places around here sell. What did blueberry used to taste like? Fun fact: bananas used to taste like the laffy taffy banana flavor! I was only 7 when it changed, but I’ll never forget it. It was MUCH milder in flavor, more like just a hint of blueberry. With the crust part of the pop-tart… it was perfection. I had to find an image of the old box. Look at that typography! I love it. bananas used to taste like the laffy taffy banana flavor! Yeah, that is so neat! You can apparently still get those bananas in certain areas, and it’s definitely something I’d like to do once in my life. In my world there is only frosted. wait what? i’ve never seen a banana pop tart!!!??? i thought y’all were joking???!!! and i’m now realizing from your photo that pop-tart has a dash! that typography IS amazing. the little circle on the lowercase r! the angled top edge of the t! smucker’s has a proprietary font and frosted is outlined! it’s incredible. Oh no, I was referring to actual bananas, not food that tastes like bananas.